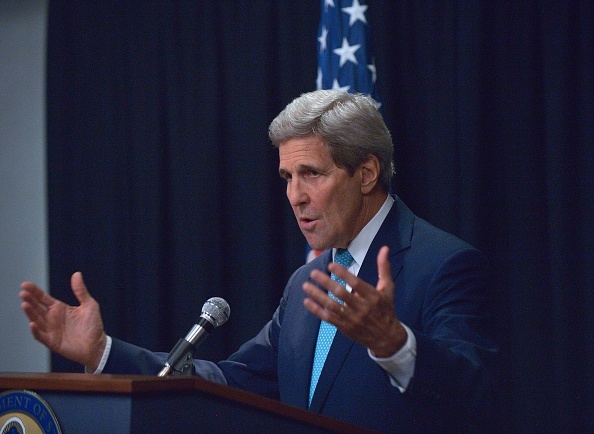 US Secretary of State John Kerry, who is visiting Riyadh, welcomed the proposal. Saudi Arabia proposed a five-day humanitarian truce in Yemen on Thursday after weeks of airstrikes and fighting, but said a ceasefire depended on the Houthi militia and its allies also agreeing to lay down arms, Foreign Minister Adel al-Jubeir said. U.S. Secretary of State John Kerry, addressing a news conference alongside Jubeir in Riyadh, welcomed the proposal and added that neither Saudi Arabia nor the United States was talking about sending ground troops into Yemen. Hundreds of civilians have been killed in air raids and fighting since a Saudi-led coalition began strikes against the Houthis on March 26, aimed at pushing the Iranian-allied militia back from captured areas and restoring President Abd-Rabbu Mansour Hadi’s government. The fighting and a coalition arms embargo have also caused hunger and shortages of food and fuel, worsening Yemen’s humanitarian crisis and prompting alarm around the world. “The pause will affect all of Yemen for a period of five days. The actual date will be announced shortly as well as the requirements. This is all based on the Houthis complying with the ceasefire,” Jubeir said. Kerry added that he was “very, very concerned” by Iranian activities in Iraq, Yemen and elsewhere.